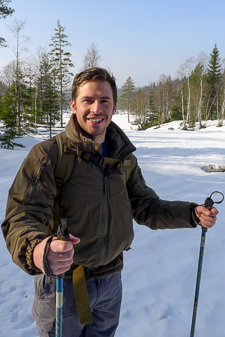 Henry joined the Frontier Bushcraft instructional team in 2012. Henry has enjoyed the outdoors since he was very young. With family in Scotland and Sussex, every holiday while growing up was spent in one of these places. Whether damming rivers (and then being asked to un-dam them) or building tree houses, Henry was out and about in the natural world whenever he could be. At school he was an Army Cadet, taking part in training in the Cotswolds and Snowdonia. At the age of 16 he took part in a charity expedition rebuilding a school in Khyber pass and hiked in Pakistan, Afghanistan and Kashmir. Embracing travel and nature Henry has since spent time in Africa, Asia, Europe and North America. He has a thirst for adventure and enjoys hiking in varied environments, from the Dalmatian coast to the jungles of south east Asia. Recently Henry reached the summit of Kilimanjaro with minimal support. Henry first started learning about Bushcraft under Paul's guidance in 2008, taking part in numerous courses and making some great friends along the way. Henry particularly enjoys woodcraft and flint knapping. For five years Henry has made his living as a professional model maker for a large architectural firm, employing hand-craft and technical skills for which he has a natural affinity. Henry is a also keen sportsman who sails, rock climbs and runs in endurance races. Henry is a qualified Mountain Leader as well as holding the Single Pitch Award.